This year’s Chinese New Year celebrations are only a few days away, and the Festival Committee has planned its biggest event yet. The weekend of 16th-18th February, sponsored by ourselves, Birmingham Airport and Birmingham City Football Club, will see in the year of the Earth Dog, symbolizing action, heralding in a year filled with achievement and renewal. This year the festivities spread beyond the Arcadian Centre, spilling over into our newly created Southside Square, as well as being joined by additional activities in the nearby Colmore BID area. There will be a New year Fundraising Dinner at the Chung Ying Garden on Thursday 15th February (7.30pm onwards, with tickets available here), followed by activities at Colmore Row on Friday, the Chinese New Years’ Eve. These will include a free lunchtime concert in the grounds of St Philips Cathedral (reserve a ticket here, or just turn up on the day), and a drinks reception and Lion dance for local businesses in the district. Festivities on Saturday, 17th February, kick off at midday with a Lion dance procession passing from the Bullring down to Debenhams for Rosie Kay’s Modern Dance Warrior performance at 1pm. At 2pm live classical music from the Birmingham Conservatiore is followed by more Lion Dancing at Grand Central Station. -11.30 to 4.30pm: Free craft workshops (calligraphy, graffiti, mask-making, lantern-making and drums) at the foyer of Birmingham Hippodrome. 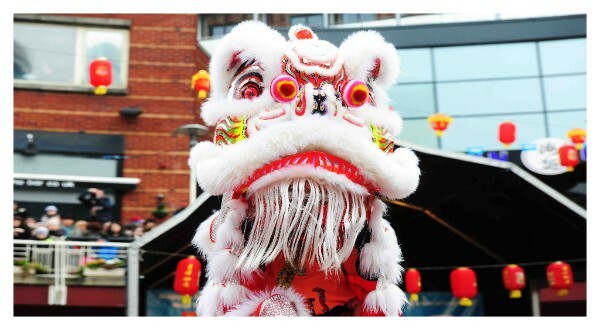 – 12.00 noon: Chinese New Year opening ceremony with speeches from James Wong, chairman of the Festival Committee and the Lord Mayor of Birmingham, Councillor Anne Underwood. Lion dancing and firecrackers mark the beginning of the festival. -12.00-4.00pm: Birmingham City Football Club’s interactive Fanzone on Inge Street will offer penalty shoot outs and other football-related fun. -12.30 to 1.00pm, 2.15 to 2.45pm and 3.00 to 3.30pm: Birmingham Conservatoire classical music performances at The Patrick Centre in the Birmingham Hippodrome. All performances are free but require tickets which can be booked here. -12.30pm to 3.30pm: The Chinatown’s Got Talent singing competition. – 12.30 and 3.30pm: Rosie Kay’s Modern Warrior. – 1.00pm to 3.30pm: Chinese artist and local community performances, including acrobats, circus acts, contortionists and fire performers. – 4.00pm: Lion dancing and firecrackers accompany the closing ceremony. In addition there will be food stalls, lion dancing, circus performances and much more.